When your window air-conditioning unit spits out less-than-cool air, you may think it's time to recharge it with new refrigerant. But the unit may just need a cleaning instead. Refrigerant doesn't require recharging unless the closed-loop system developed a leak. Because of the ozone-depleting pollutants in the refrigerant, it's not a good idea to recharge a window AC unit yourself. Recharging refrigerant or fixing the leak is best left to certified HVAC technicians. Keep your cool by cleaning your AC window unit. The components inside a window air-conditioning unit include a compressor that pumps the refrigerant, two coils, a sealed tube filled with an EPA-regulated refrigerant, a blower and a fan, an expansion valve that opens to let refrigerant move, a filter and control unit. The unit has two separate evaporator and condensing processes that operate on the same principle as how water evaporating on your skin cools you down. 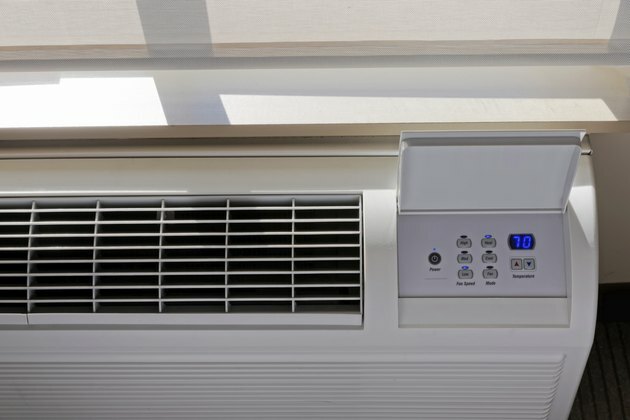 Ingeniously designed, a window AC unit removes the heat from the room's air and replaces it with filtered cool air. A blower inside the air conditioner pulls the room's warm air over the evaporator coils. The heat in the air transfers into the refrigerant inside the sealed coil, changing the refrigerant from liquid to gas, which then condenses back to a liquid form when the refrigerant releases the heat to the outside after moving into the condensing coils. The compressor, the heart of the system, changes the pressure of the refrigerant to send it to the correct coil -- evaporator or condensing -- as it pumps it through the unit. The cool-air part of the unit sits inside the room separated by insulation from the hot-air side located near the back and outside the unit. During the evaporative cycle, moisture in the room air condenses on the coil because it has a lower temperature than the air's dew point. The collected moisture falls to a drip pan where it drains to the outside, allowing delivery or cool, dry air. While the rising temperature of summer may tempt you to run down to your local discount store and pick up one of those refrigerant recharge kits for your warm-blooded window AC unit, it's not a good idea. Under section 608 of the Clean Air Act, the EPA requires certified technicians to service AC units because of the high levels of pollutants the refrigerant contains. The EPA also requires the refrigerants inside the unit to be recovered, reclaimed and recycled by licensed technicians. A dusty filter or dirty fins may be the real problem. Remove the trim panel or filter holder and pull it from the window -- with help, on heavier models -- and then remove the case and mounting frame. Brush and clean the outside fins gently with a soft-bristle brush dipped in a mixture of water and several squirts of dishwashing liquid solution from a bucket. Match the fins on the outside of the unit to an inexpensive fin comb to re-straighten them after cleaning. Vacuum the dust and debris buildup from both the evaporator and condensing coils. Spray both coils with an AC no-rinse foaming coil cleaner found at most home improvement stores. Clean the fan blades and oil its shaft if it has a removable rubber or plastic cap. Wash or replace the air filter. Call a professional if the unit fails to work after cleaning.